Samsung has always wanted to put a smartphone on your wrist. With its latest effort, it mostly succeeds. If the smartwatch ever becomes a thing we buy out of necessity and not just curiosity, it’ll be the Gear S3 Frontier that deserves much of the credit. While Apple and Google command most of the attention in the smartwatch space, it’s actually Samung that has consistently led the way, bringing innovative features and unique touches that push the limits of what we expect from wrist-worn wearables. The journey hasn’t been without its share of missteps—who can forget the original Galaxy Gear’s strap camera—but with each new model, Samsung refines a little more of its vision, taking a slow and steady approach on what is largely an unchartered path. The Gear S3 isn’t so much a continuation of this strategy as much as it is a culmination of it. Samsung’s latest smartwatch isn’t perfect, but after years of experimenting with various concepts and features, it finally feels like there is a strong platform to build on. And if Apple and Google aren’t taking notes, they should at least take notice. The first thing that grabs your attention with the S3 is its size. It’s big. Like, really big. At 1.3 inches, its display is noticeably larger than its predecessor’s 1.2-inch one (not to mention 1.5mm thicker and 10 grams heavier), so Samsung’s not trying to appeal to every wrist here. At $349, however, you’re not paying a premium for the extra size. You’ll need to have a relatively large wrist to handle the Gear S3 Frontier. Truth be told it’s not the type of watch I’d generally be interested in buying, but it didn’t look terrible on me. And despite the heft, it wasn’t uncomfortable in the slightest. The classic roundness adds a touch of class, and the traditional silicone strap didn’t pinch or chafe my skin like Apple’s sports bands tend to do. Still, last year’s S2 is downright svelte by comparison, and it’s a little surprising Samsung didn’t make a smaller version for slighter wrists. I tested the Frontier version of the watch, and the large bright display really popped against the dark metal body. Large textured buttons and bezel accents gave the watch a true rugged look that is somewhat reminiscent of a higher-end Casio G-Shock, especially when paired with one of the chronograph faces. In fact, many of the bundled watch faces are skeuomorphic, echoing Samsung’s main strategy with the S3: It looks like a watch because it is a watch. Samsung also offers a slightly less ruggedized “Classic” Gear S3 design. Samsung has stuck with its 22mm pin-based bands for the S3, which opens up an array of options for styling. Like Apple’s method, official bands are a cinch to swap out, utilizing a tiny switch on the underside that quickly disconnects the pin from its housing. If you don’t like the S3 Frontier’s silicon band, you can easily swap it out. It isn’t quite so easy to install a regular watch band, requiring a spring bar tool (or something long and sharp) and some patience, but Samsung sells enough official bands to where it shouldn’t really be an issue. Besides, the silicone strap the Frontier comes with is quite nice, with a textured pattern that looks like its made of carbon fiber. And Samsung is doubling down on its patented rotating bezel, which is integral to both the look and function of the S3. On the Frontier, the chiseled bezel makes it look something like a diving watch (though with the same IP68 water resistance as the S2, you probably shouldn’t take it too deep), and it does well to both accentuate and protect the recessed display. And it’s that display that commands all of the attention, and not just because of how big it is. 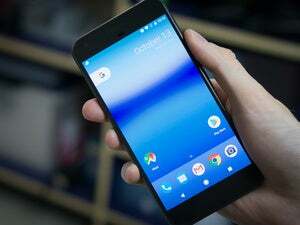 Its 360x360 Super AMOLED Gorilla Glass screen has the same resolution as the S2’s at a larger size, which means you’re actually getting less pixel density. But with bold, bright colors that hold up extremely well in direct sunlight, the 24 fewer pixels per inch won’t be missed. The Gear S3’s display holds up well to direct sunlight. As with the S2, there is an always-on option for the display (interestingly hidden in the Style settings), and it looks great when activated, so much so that from a distance people will likely mistake it for a regular wristwatch. However, even with auto low brightness toggled, keeping the watch face visible had a major impact on battery life. I still got comfortably through the day, but without charging it overnight, it wouldn’t have fully made it through a second, despite the S3’s larger 380mAh battery (compared to the S2’s 250mAh one). I didn’t mind—quite frankly, I never understood the bother of charging your watch every night anyway—but people expecting to get several days on a single charge might be disappointed. Without the display on, I was able to comfortably push the battery into the second day, but even when I turned the brightness way down and shut off automatic heart-rate monitoring, I wasn’t able to hit the promised three full days of use. Still though, battery life never affected my daily activity, and Samsung’s wireless charger looks so good on a nightstand (even rotating the display so it’s readable), I was perfectly content taking it off each night, even if it wasn’t begging for an immediate charge. Just because the Gear S3 doesn’t look like your usual smartwatch doesn’t mean it doesn’t act like one. Under the hood it has a 1Ghz dual-core 64-bit ARM Cortex-A53 with 768MB of RAM, and while it still runs Tizen OS, it doesn’t feel like an also-ran. It doesn’t quite have the polish of Apple’s watchOS, but Samsung has created a platform that’s in some ways superior to its competitors, with simple, intuitive navigation that is among the best I’ve ever used. Even though it was my first time using a Samsung smartwatch, my first instinct was often the correct one. Where my previous encounters with Android Wear were littered with early missteps, the Gear S3 provided no such learning curve. The Gear S3 looks as good on its charger as it will on your wrist. The main reason for that is the clever rotating bezel, which serves to eliminate much of the need to touch the screen. I found it to be more natural and precise than the Apple Watch’s Digital Crown, and was able to zip through apps and screens with ease. Scrolling through menus and text is particularly pleasant while turning the bezel, and I found reaching it far more pleasant and instinctive than tapping or swiping against such a tiny screen. Even playing games was fun using the bezel as a controller, and I never really enjoyed gaming on other smartwatches. Samsung has built other functionality into the bezel as well, letting you rotate to respond to calls or silence alarms, and it’s clear it will remain a core feature of Samsung’s future smartwatches. As will the S3’s other standout feature: built-in GPS and 4G LTE. With its own speedy cellular service on board, the S3 Frontier is truly like having a smartphone strapped to your wrist, the elusive dream of every smartwatch. You’ll need to piggyback off your existing data plan—an extra $10 for AT&T customers, or $5 for T-Mobile subscribers (Verizon hasn’t begun selling it yet, but when it does it’ll be $5 too)—but the expense is well worth it. The Frontier will go everywhere you do, even if you leave your phone at home. If you forget your phone (or just leave it at home), you won’t miss it. About the only thing the watch won’t do is snap pictures. You’ll be able to take and make calls, get notifications, send messages, check sports scores, and do pretty much anything else your phone can do (assuming there’s an app for it, more on that later). Of course, the Gear S3 isn’t the first smartwatch to feature LTE, but the implementation here goes beyond the convenience of getting emails, messages, and calls on the go. As its name suggests, Samsung isn’t just giving you the option to leave your phone at home. It wants you to explore the world with the Frontier. To that end, it has expanded the S3’s capabilities as an outdoor companion, with new sensors and apps designed to track your movements. The altimeter and barometer measure how high you’ve climbed and detect sudden atmospheric changes, and the Speedometer app will show the maximum speed and distance traveled on a bicycle ride. I’m no exercise enthusiast, but flights of stairs I climbed and steps I took were accurately tracked, and after a few days with it, I actually found myself looking forward to the occasional notifications to stretch. Beyond the outdoorsy stuff, Samsung has also made the Frontier a Samsung Pay companion, with support for both NFC and MST (Magnetic Secure Transmission) terminals. That means you only have to load it up with a credit card and you can use it virtually anywhere you would normally swipe your card. To access Samsung Pay, just hold the top button for a second. It worked flawlessly wherever I tried it, though you can’t use it at terminals where you insert your card rather than swipe it (gas stations, mostly). And while Samsung Pay supports a number of banks and cards, Chase and Discover are two notable holdouts. Still, it’s a fantastic feature, and the real-world use blows away what you get with other watches. And you don’t even need one of the latest Galaxy phones to take advantage of it. Samsung has quietly infiltrated the Google Play Store with its very own Gear app that mimics what you’d get with a Galaxy S7, right down to storing and accessing credit cards. Along with the Galaxy S7, I tested the Frontier with a Pixel phone, and the experience was virtually the same, save a couple location issues and notification quirks. Samsung clearly dreams of building an app store that rivals Google’s, and the Gear app is a small taste of that. But getting developers to buy into it is another issue altogether. Samsung includes its own store for the Gear, but you won’t find too many of your favorite apps. To entice developer support for the S3, Samsung has opened up the bezel to developers, but the shelves at the Gear store aren’t exactly filled. While there are a few major brands represented (ESPN, Uber, and newbie Spotify, to name a few), you won’t find essential smartwatch apps like Facebook, Twitter, Nike, or Strava. There are a couple very nice exclusive offerings and many gorgeous watch faces, but most users will be stymied by the notable gaps that exist in the Gear store. Samsung may boast that there are some 10,000 apps available, but for the most part, the quality is nowhere near the kind that you expect from a major mobile app store. And it’s doubtful it ever will be. It’s hard not to recommend the Gear S3 watch, but the size a big caveat. For one, people with slight wrists—and I’d imagine, most women—will be immediately turned off by the enormous size. As something of a conciliation, Samsung is still selling the smaller S2, but at $249, you’re not paying much less and you’re getting last year’s technology. Tizen on the Gear S3 is one of the best smartwatch OSes you’ll ever use. But with the uncertainty surrounding the future of Android Wear, the S3 is a fantastic choice for anyone who wants a smartwatch right now. It’s been over a year since we saw any really meaningful new Android Wear watches, and it’s not entirely clear how long we’re going to have to wait to get one. Android Wear 2.0 seems likely to be delayed for at least several more months, and major manufacturers have signaled a wait-and-see strategy. 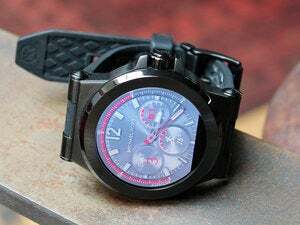 Besides, Samsung already has a head start on whatever the next generation of Android Wear watches look like, and it’s hard to imagine anything Huawei or LG releases will be able to top Samsung’s list of features. Samsung was the first to bring the promise of full smartphone functionality to the wrist, and with the Gear S3, it’s finally delivered a complete package. Even with a dearth of apps, the Frontier is the fully realized, full-featured independent smartwatch we’ve been waiting for, with a smart, stylish aesthetic and an OS optimized for the wrist. Someday every smartwatch will be as capable as a smartphone, from the luxurious ones wrapped in rose gold to the no-name knockoffs for sale in the bargain store. But until that day arrives, the Gear S3, huge though it may be, is the best glimpse of just how awesome and liberating that future will be. The Gear S3 Frontier is a great-looking smartwatch that truly lets you leave your phone at home.